This series was one of the first that I read from Marvel Unlimited and also completed in a row. I didn’t jump off to any other books which testifies to the writing and the character development. 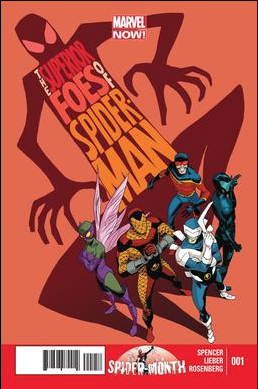 Maybe there needed to be a lot of story because Boomerang isn’t exactly a fleshed out Spider-villain. This series was really very funny and also had a lot of twists and turns. I’m going to start keeping rack of my Marvel Unlimited reading list here, because their reading list is basically non-existent. I have read a lot already and I am more inclined to keep my MU subscription and dump my WWE Network subscription because this is getting much more use. Can I give more than my heart ? AJ Styles says “GLAAAAH!” about his WWE status! According to Wrestling Observer Newsletter, AJ Styles is actually not under contract with New Japan or Ring of Honor at this time. Styles is free and clear to work anywhere he wants to work, and could field an offer from WWE, but the ball appears to be in their court. At the age of 38 with a wife and kids, Styles is working where he can make the most money. He is in a great position with NJPW and ROH, as he is a top guy in both places and works with all of the top talent. He is also loading up his schedule for early 2016, including working with Rey Mysterio in the UK. Seth Rollins out 6-9 months; WWE Title in abeyance! Fans in attendance at tonight’s WWE live event in Dublin, Ireland noted that WWE World Heavyweight Champion Seth Rollins may have injured his knee or leg during the No Holds Barred main event against Kane. Rollins was doing a move out of the corner, when he landed awkwardly on his leg. After the match, he appeared to be hurting as well and was helped to the back by WWE trainers. Rollins tore his ACL and MCL and will be out 6-9 months. The WWE World Heavyweight Title is in abeyance, and the WWE will hold a tournament at Survivor Series 2015. Archie is played by Jack, and Incher is Edith. Or the other way around. Edith/Jack or Incher is wearing a wig.to appear like a woman. Edith walks in from the gym as Archie is standing in the kitchen, there are a couple of cats and food at his feet, and a half empty 20 gallon aquarium fish tank. Archie: Ee-dit! Guess what happened when you was gone. Ash was hiding from me and I couldn’t find him and I wanted to check his paw because if you remember he was stung by a bee on his paw, soI called the cats so I could find Ashie and check his paw, and Ashie and Calypso and Ranger came and Ashie’s paw looked fine, so thats great! But then I decided not to give the cats treats because I was only calling them to check Ashie’s paw and went to walk by Calypso, who was standing by the bedroom door, she in such a sad way! and went “Moo!” “Moo!” Ha ha ha! Then we have a pause and they look at each. Pause. Then cut to a shot of Jack/Archie powerbombing Incher thru a table in the kitchen surrounded by cats. I sat back to watch a little Continental Championship Wrestling, one of those “forgotten” territories. CCW ran out of Alabama if I am not mistaken. Later on, it was renamed Southeastern Championship Wrestling. I am enjoying this stuff because I never got to see guys like Tim Horner, The Nighmares, or even Tommy Rich, in many of the other more popular promotions. I have downloaded 1986 thru 1989, and each year has over 25-30 episodes so this will be a longstanding watch-list.